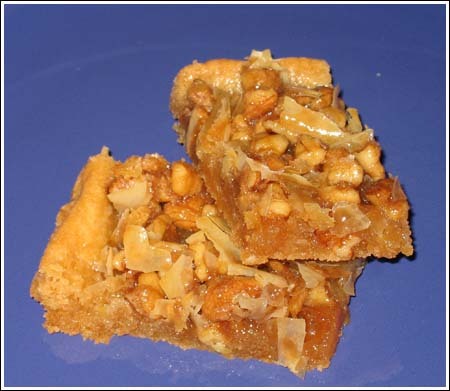 Here’s a picture of another Betty Crocker recipe called Baklava Bars. The Baklava Bar recipe combines a sugar cookie base and baklava-style topping. Rather than deal with phyllo dough, the cookie’s creator opted to break up those little frozen mini phyllo shells. Absolutely brilliant, I say! The only problem was that the ingredients were (for me, at least) a bit on the expensive side – not outrageously so, but enough to where you have to ask yourself twice whether or not your want to buy them. In the end, I found them to be well worth the money. Speaking of money, those of you with more money than time might consider using refrigerated cookie dough for the base. I don’t know why it wouldn’t work. If I were doing it that way, I’d press about 12 or 16 pre-formed sugar cookie dough rounds into the bottom of the pan, bake them for 8 minutes or so (just until set — not fully cookied) then do the topping stuff as the recipe suggests. Those of you with more time than money might consider using a shortbread dough. Anyway, I have no idea whether either of those ideas would work but it seems like they would. thank you to share such good recipe with us. I have a problem I don’t know if I should pour warm syrup on warm cookies or let them cool. I am looking forward to trying this recipe. I just tried another winning recipe in the Betty Crocker contest, the Apple Cheesecake bars. They are delicious! I’ve already made your Chocolate Peanut Potato chip creation too and they are super delicious too!! My friends and family love me because I keep giving away all these delicious treats. I tell them that they should be thanking Anna instead of me and of course I recommend your blog to them. Tori, I’m waiting for a review on the baklava cookies. I loved them, but only ate one and gave the rest to my dad, who gave them to his co-workers. Janet and Jackie, thanks for the nice comments. Jackie, if you get a cookie jar make sure it’s air-tight. Some of them are more decorative than useful. For instance, my cow cookie jar. Congratulations on winning the Betty Crocker contest. I just got the e-mail announcing that you are the winner. I feel like I know you so when I was telling my husband about it I felt like I was telling him about something a friend of mine had won. You are an inspiration. Right now I am in the middle of moving to NC but I plan on baking often when I am settled in the new home. You have inspired me and shown me that no matter what is going on there is always time to bake cookies and cakes! So I plan on always keeping the cookie jar full in the new house and I will be trying a lot of your wonderful recipes. A BIG congratulations to you for winning the Betty Crocker Cookie Mix Contest! I just saw your picture on the email I received from BC….I took a double take…IT’S Anna! I know you mentioned those bars had won but I didn’t know it was this year! I am thrilled for you. Thanks for all the great recipes! I also am laughing because when you drink coffee, you sound like me. I bet you’d be able to pick out the posts I wrote while on a caffeine buzz. When I checked out the site again today just before I linked you and it, this recipe really caught my eye. I am going to try it as soon as I get to the store for the ingredients!